Cute cat alert! You’ve been warned! Reading the following post may cause random acts of snuggling. 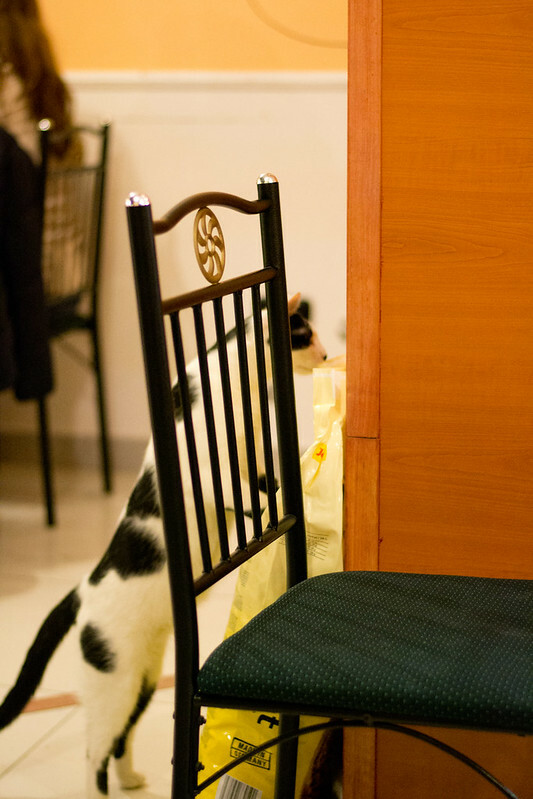 These days it seems like there are cat cafe’s popping up all over. A phenomenon that has it origins in Taiwan, with the first opening in 1998, and gained popularity in Japan, they have spread around the world. 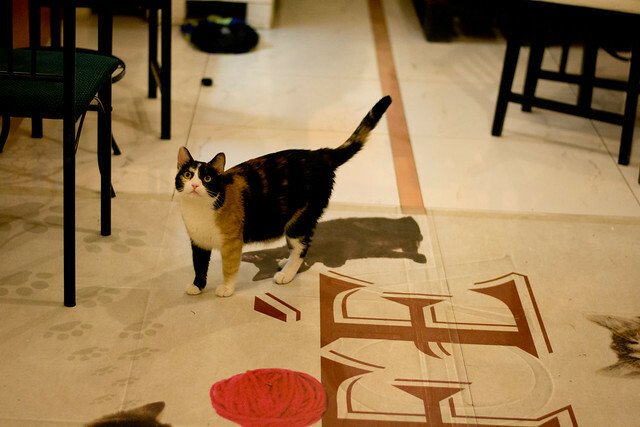 There are cat cafes in South Korea, Thailand and now they’re making their way across to North America with cafés opening up soon in San Francisco, and one even one in Vancouver (!!!). 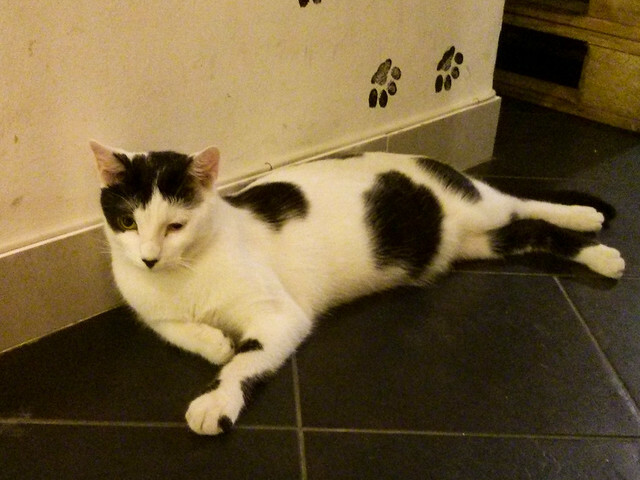 And yet, it caught me by surprise that there would be a cat cafe in Budapest. After all my time living there, I generally do not think of Budapest as such a forward thinking and progressive city. Not to mention trying to get around all the laws involved with opening a cafe that serves drinks and snacks while having a bunch of cats roaming around. Surprisingly, they have made it work. And in more than one location to boot! There are two cat cafes in Budapest and I visited by St. Stephen’s Basilica for some snuggles with these furry creatures. The other one is located further away from the city centre, by city park and Hero’s Square. While in university, I had a cat. She was adorable and acted like she was a dog most of the time: greeting me at the door, super affectionate and wanted attention all the time. At one point, I had no roommate and was cat sitting for two others. It was just me and three cats. I’m not a crazy cat lady I swear! I gave my kitty to a friend of mine when I decided to move to Budapest. She is now in Utah. Even my cat, though she isn’t mine anymore, is a traveler! Isn’t she the cutest?! Her name is Tippy because when I first got her, her the tip of her tail was a completely different colour. I’m so original at naming things aren’t I? Going to the cat café was the purrrrfect (corny and predictable, but I couldn’t resist. Please don’t hurt me) opportunity to cuddle some kitties and destress with some furry creatures. I had always preferred dogs growing up, but it wasn’t until I got my own that I started liking cats. There are many different cats at the café (I think around 14, but I can’t remember exactly) and they’re all identified on the café menu with their photo and name. Every table comes equipped with hand sanitizer and the area where all the food is served is covered and separated with a door. They’ve been open for just over a year now. I’m still surprised that the government has no health or safety concerns and haven’t attempted to shut it down! The cat cafe wasn’t what I expected it to be. I had expected there to be lots of climbing apparatus, places for the cats to get up high off the ground, and lots of toys. I had expected it to look a lot like what this man did for his cats at home. 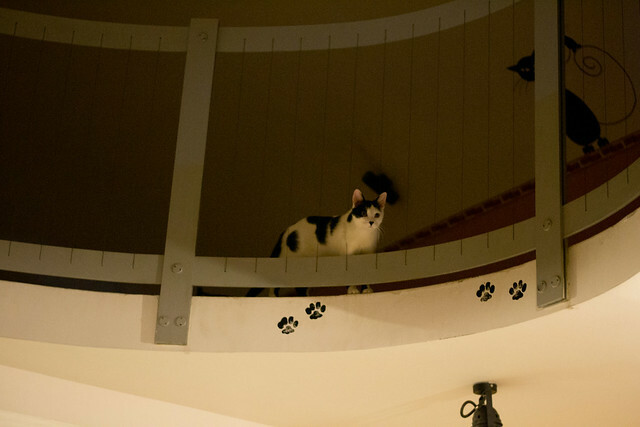 There was a room with a few ledges on the wall and climbing area, but not big enough for all the cats that they had. Maybe it is because of the time that I went, but for the most part, the cats seemed very disinterested by all the people. 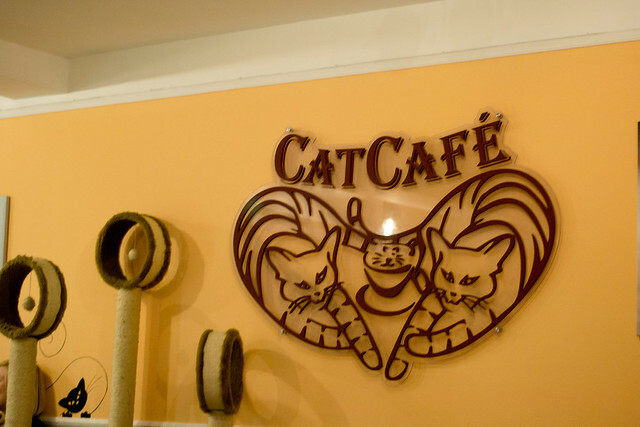 Looking at other cat cafés it seems like the cats were a lot more active. Here, they were mostly sleeping during our visit. I’m not sure how I feel about the commercialization of the cats. On one hand, these cats have a warm place to live, plenty of food and get to play with people all day. But then on the other hand, some looked annoyed to have so many people around. I felt a bit bad for some of them as I watched other patrons of the café force their affection on the cats who were disinterested and just trying to get away. Either way, they’re super adorable. Here are more shots of the cute residents! This one was going after the food which was just delivered! 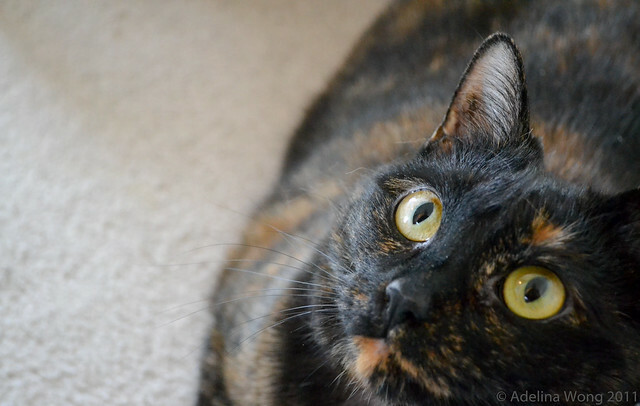 And one more gratuitous photo of my kitty. I sure do miss her! Are you a cat or a dog person? 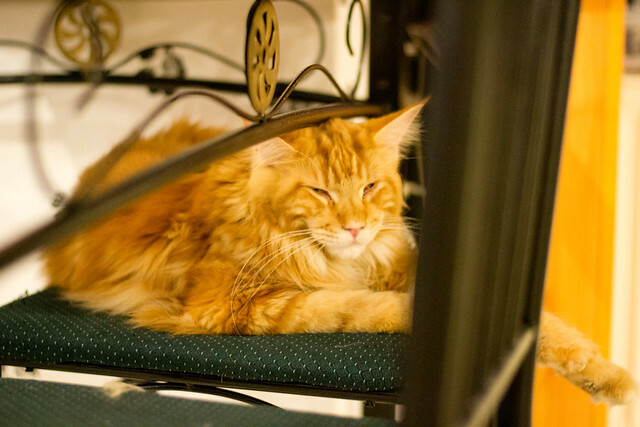 Have you been to a cat café? If so, tell me about it! P.S. Look at these adorable cats wearing hipster glasses! So cute! « So You Want to Visit the Thermal Baths in Budapest? It opened in February 2013 so no worries. You should go check out the one in London! Dog cafes exist too, but I imagine there is a lot more work involved especially walking all those dogs! 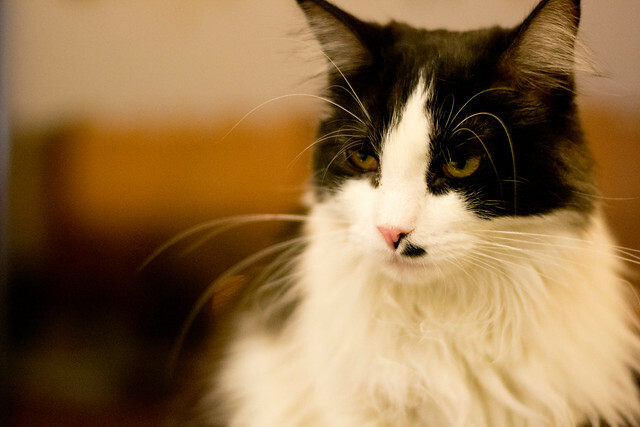 It’s funny you mentioned the part about the cats seeming irritated that so many people were around – that’s exactly how I would have expected them to act! Now dogs on the other hand, they’d be eating that attention up! 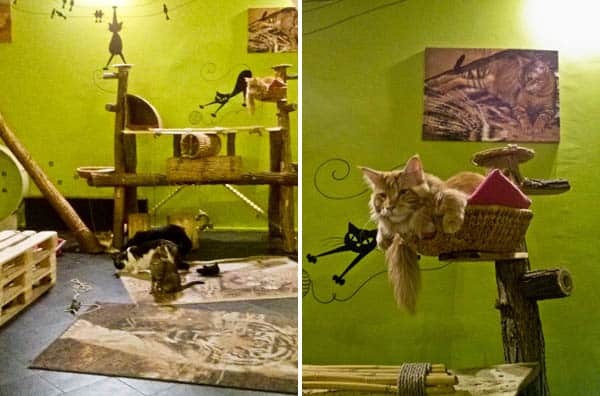 Maybe a dog cafe will pop up in your parts 🙂 Yea, the completely indifference the cats had is so typical haha. I don’t know why I didn’t expect it. Wishful thinking! If this was a puppy cafe and in the UK, I’d visit all of the time! I do like cats but I’m a dog person at heart 🙂 my best friend has a few cats and really loves this idea so no doubt we’ll go down to London and visit the cat cafe there. 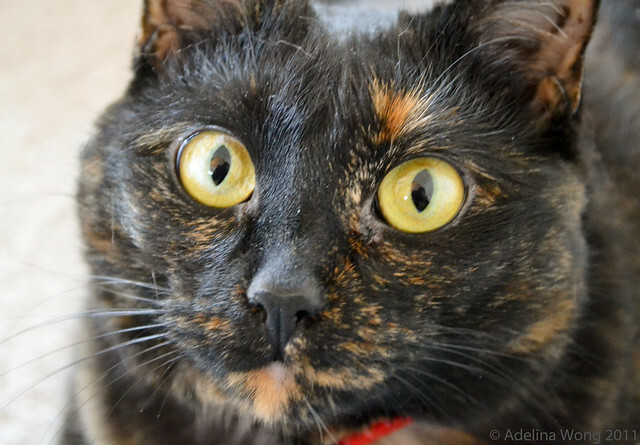 Your cat looks adorable too, great photos! Who knows, maybe one day there will be a dog cafe in the UK! We SO need one of these in Athens Greece! 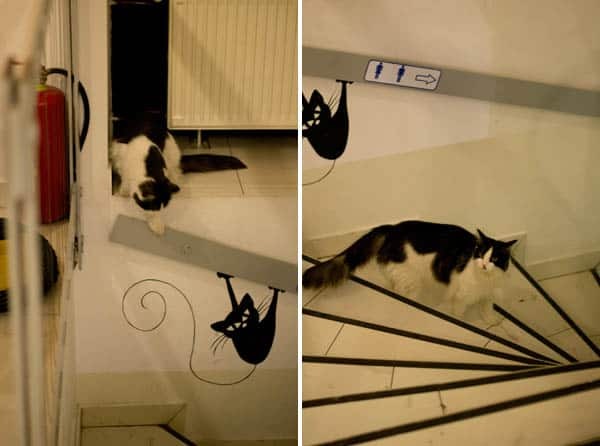 There are so many stray cats and the Volunteers would love to start up something like this. Yet I, too, wonder about the bureaucracy involved in something like this, especially in Greece. But it’s a puuuuurfect idea! That’s a great point. I remember being really aware of how many strays there were in Greece. 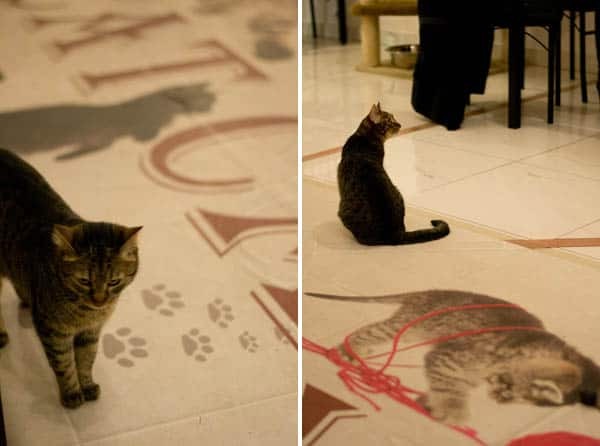 Driving around Crete I saw so many that had been run over 🙁 Cat cafes to the rescue! D’awwwww … kittEH with my coffEH. I have to super honest and say I’m not a huge fan of cats.. but I never met one that was nice to me 🙁 These cats are beautiful though and I’d love to visit if I wasn’t allergic either… Oh well guess I’ll stick to dog cafes haha. Beautiful kitty pics ! Oh. My. Goodness! I knew these were in Japan but I had no idea they were branching out all over the world! 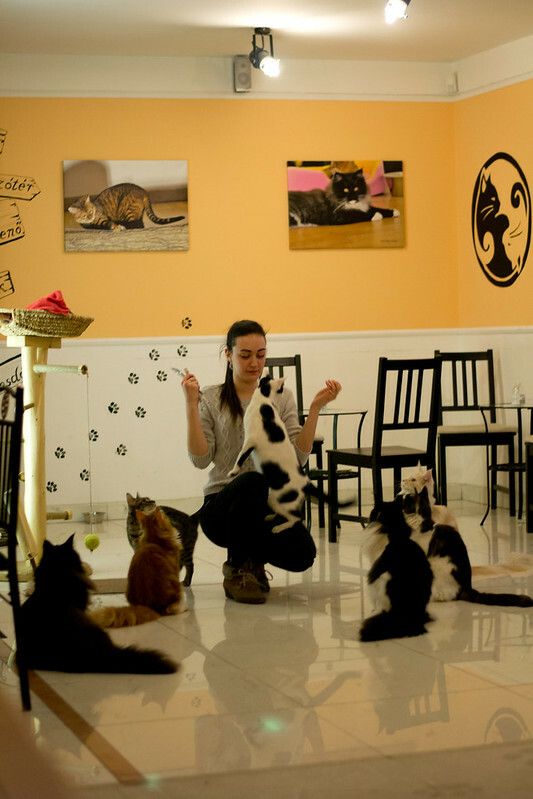 I would LOVE to go to a Cat Cafe! This one looks amazing! They’re SO adorable! Everyone needs a little bit of cuddling every once in awhile.